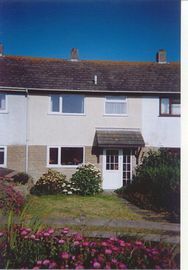 Holiday house, 3 bedrooms, sleeps 4 + cot if required, located in designated area of Outstanding Natural Beauty. 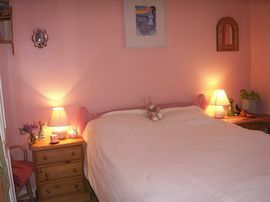 2 singles bedrooms, one with sea view, other over fields. 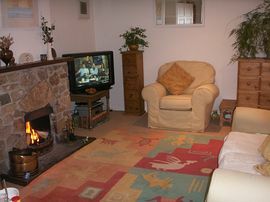 Lounge: TV with Freeview, DVD player, CC player/radio, open fire with coal and logs provided. 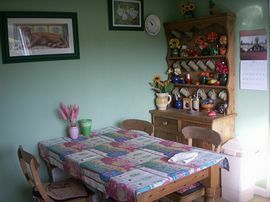 Kitchen/diner: cooker, washing machine, tumble drier, fridge/freezer, microwave, toaster, table and chairs,well equiped cooking utensils etc. Electric and heating inclusive. Iron/board, vacuum. Backroom for boots, storage etc. Back garden: enclosed with patio and garden furniture. Located in village of Trewellard, meadery and country pub serving good food. Shops at St Just and Pendeen short drive away. 10 minutes walk from coastal footpath and Levant Engine House, (or two minutes by car with free parking at cliffs), with glorious sunsets over the sea. 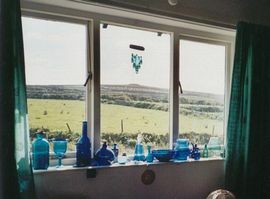 Easy walks to Geever Tin Mine and museum, picturesque Botallick cliff engine houses, Pendeen lighthouse, and walks over moors to Chun Quoit, Tregeasel stone circle and hillfort. Good location for exploring West Cornwall, many attractions including: Cape Cornwall, Penzance with day trips to Scilly Isles. Marazion and St. Micheals Mount, quaint fishing villages like Mousehole, St Ives. Large sandy beaches like Sennen, mamy smaller coves, Land's End. Minack open air theatre overlooking the sea, Trenwainten Gardens, Flambards theme park, bronze age villages Chysauster and Carn Euny, and many more places of beauty and interest. Designated Area of Outstanding Natural Beauty. Stunning coastal footpath close by with sunsets over the sea. Local Services: buses from village, village pub serving food, Meadery restaurant. shops and take aways 5 minutes drive. Take A30 to Penzance, keep on A30 then take exit following signs to Pendeen and St Just A3071. Turn off to Pendeen on B3318. Before reaching Pendeen take left exit signposted to Trewellard, turn left at bottom of hill, past Trewllard Arms pub and look for Parc An Yorth on right 100 yards or so after pub. Price between: £350 to £500 per week, available from mid May to beginning of October. Changeover day: Saturday. Available mid May to beginning of October.